To our knowledge Christian Café currently are not offering any coupon codes. This is not a real issue though, since one great perk at Christian Café is all new members automatically get a 10 day free trial. This allows you to try out all aspects of the dating service including sending and receiving emails. They have been offering this deal for over 20 years now, and no other site that we know of does without requiring a credit card. Click here to Sign Up for Christian Cafe's 10 Day Free Trial. We have not been notified of any new sales or coupons for the award winning dating service Christian Cafe. The best place to find out about any deals is the Christian Cafe subscription upgrade page when you create your free account. We will update this page when Christian Cafe lets us know of any new sales or discounts. 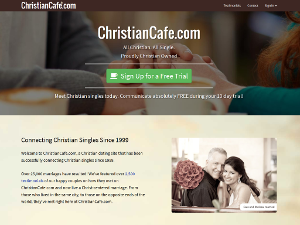 To find out more about this popular Christian online dating site, you can take a look at our Christian Café review.